Giant Burgers: When Will it All End? Diet & Weight Loss Patches: Worthwhile or Worthless? Ending Food Cravings: Help, I can't Stop Eating the Ice Cream! Calories Don't Count - Or Do They? 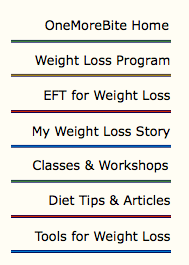 Why Use EFT for Weight Loss? Good Food / Bad Food What's Left to Eat? Is Beef Still Safe to Eat?